So here is my first post! I am super excited! My newest manicure, Nina Ultra Pro in Emerald City with a Ladybird filmo silce on my accent nail. This polish is from Sallys but to be compleatly honest I hadn't heard of the brand before, but I love it and it is so much cheaper than all the other brands they stock (China Glaze and OPI). 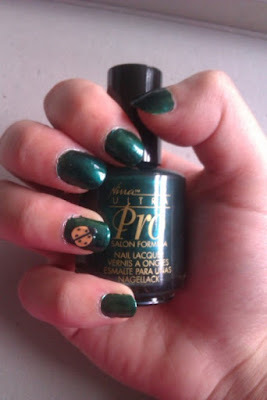 This metallic green was completely opaque in one coat on my short nails (you might need two for longer nails). Green is my favourite colour so any chance to wear green makes me happy! Overall i am really happy with this one!